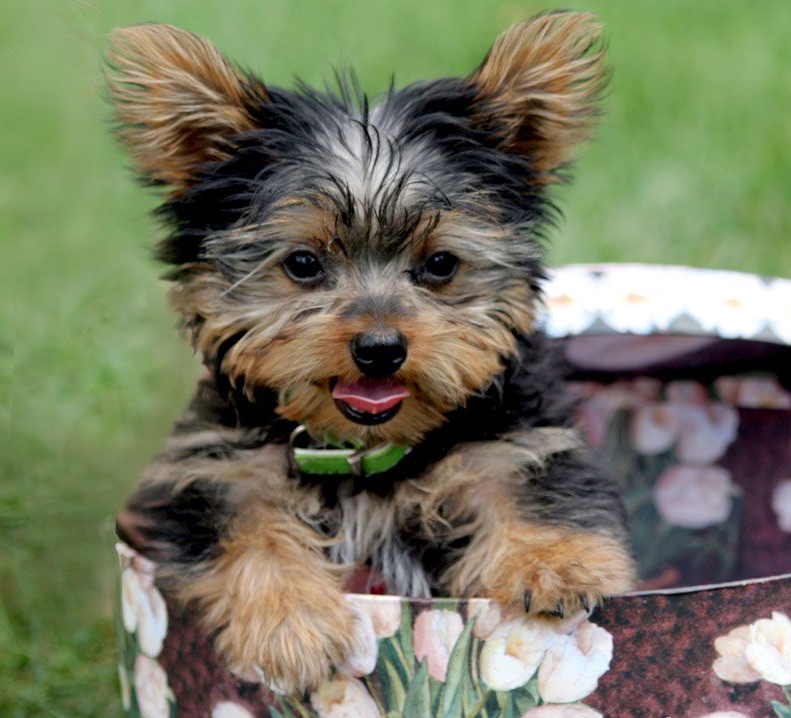 Yorkshire Terriers also known as Yorkies are one of the most popular dogs among the toy breeds. The Yorkshire Terrier is lively and inquisitive, physically and mentally alert and spends much time dashing around checking things out. He is also a lover of comfort and enjoys cuddling on laps and snuggling into soft pillows. Scottish weavers migrated to Yorkshire during the industry revolution to work in the coal mines, textile mills and factories, bringing with them a dog known as a Clydesdale Terrier or Paisley Terrier. These dogs were much larger than the Yorkshire Terrier we know today, and it's thought that they were used primarily to rid the mills of mice and rats. The small dog could also fit into burrows of animals to chase them out. It is said that people used to make sarcastic remarks about the dog coats that they were products of the loom from the clothing mill in which the weavers worked. Despite this perception, the breed flourished and was named for the city of Yorkshire, England, in 1870. Yorkies were bred down in size over time to become the tiny toy dogs so popular today. The breed appeared in the United States in 1872. Yorkshire Terriers were first registered in the British Kennel Club stud book in 1874. The first Yorkshire Terrier breed club in England was formed in 1898. 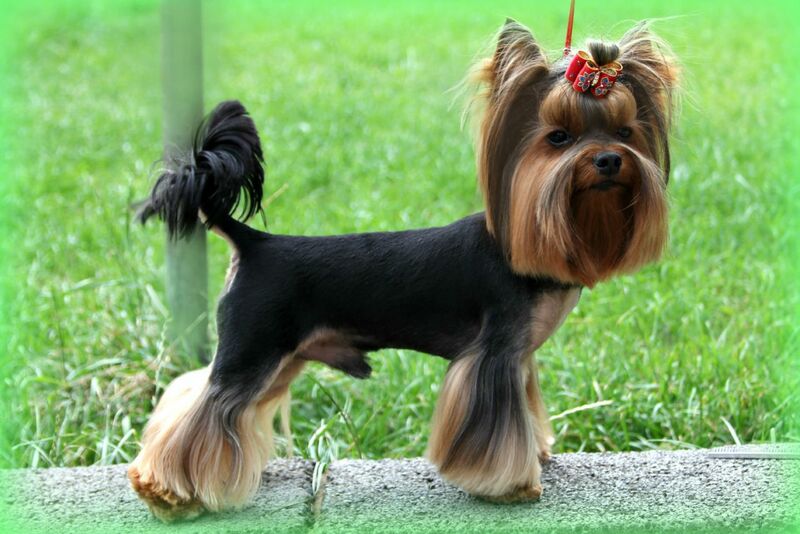 The Yorkshire Terrier has also contributed to the development of other breeds, such as the Australian Silky Terrier. The Yorkshire Terrier is a small, toy-sized dog. The small head is rather flat on the top, with a medium-sized muzzle and V-shaped ears.The nose is black and the medium-sized eyes are dark with dark eye rims. The coat is long and silky and comes in colours of steel blue and tan. The hair must be glossy, fine and straight. Traditionally the coat is grown out very long and is parted down the middle of the back, but "must never impede movement”. The coat is sometimes clipped short for easy maintenance, especially near the face. When a Yorkie weighs 2kg or less full grown it is often called a teacup. To achieve this small size breeders often need to breed runts with other runts. The dogs sometimes have health problems due to their abnormal small size. Don’t let their size fool you: Yorkshire Terriers may be small in size but they are big on personality. They need to be trained or can become snappy or unruly. They are brave, curious, energetic and affectionate companions. With their keen senses, Yorkies make excellent watchdogs. However, this can make them too quick to sound the alarm at every new sight and sound. You have to be equally quick to stop them before this tendency to excessive barking becomes an established habit. If that training is to be successful, your Yorkshire Terrier needs to respect you so that he stops barking when you tell him to. No matter what home they live in, they'll get along with other resident dogs and cats as long as they were raised with them. Yorkshire Terriers may become possessive of their owners if a new pet is brought into the house. Being terriers, they may want to challenge the "intruder," and if a fight breaks out, the terrier spirit is to fight to the death. Take a lot of care when you're introducing a new dog to other animals in your household. Housebreaking is notoriously difficult with Yorkshire Terriers, especially in cold or wet weather. You may consider crate training or teaching him to use an indoor litter box or you could install a doggy door leading out into a small covered potty yard. Yorkshire Terriers need only limited exercise due to their small size. Daily interaction, play and a walk will help expel energy. They are active indoors and suitable for apartment life. Without daily brushing and combing, Yorkshire Terriers become a matted mess. If you can't commit to the brushing, you have to commit to frequent trimming to keep the coat short, neat, and healthy. You can even shear the coat very short with clippers and then you won't need to brush it at all. This breed also has a propensity for dental problems, so get comfortable with brushing your pooch’s teeth. Ears should be cleaned and the nails trimmed weekly. Yorkshire Terriers are sensitive to cold temperatures and prefer warmer weather. In addition to their temperature sensitivity, they are prone to Luxated Patella, Bronchitis, eye problems, tooth decay and Herniated disks. Additionally, Yorkies often have a delicate digestive system, with vomiting or diarrhoea resulting from consumption of foods outside of a regular diet.The relatively small size of the Yorkshire Terrier means that it usually has a poor tolerance for anaesthesia. Their average life expectancy is around 12-15 years. 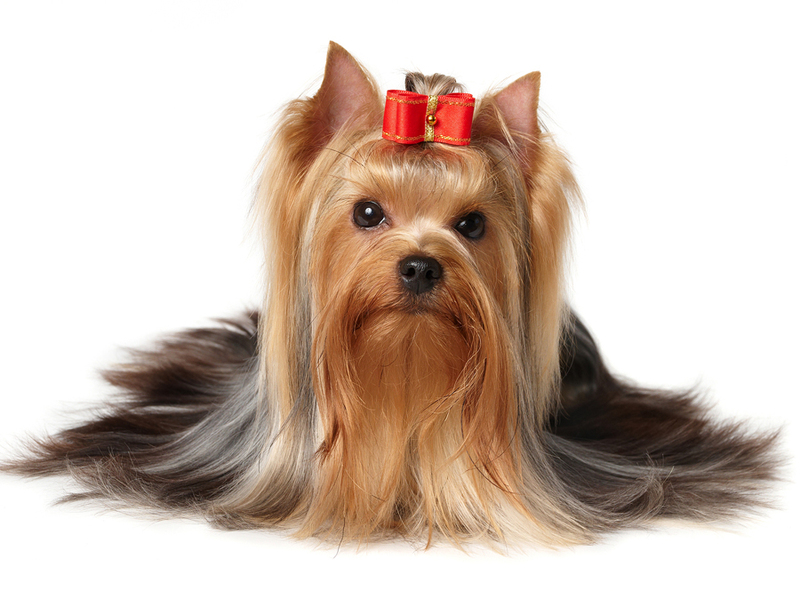 Yorkshire Terriers are companion pets, ratters and competitive show dogs. Too many people acquire a toy breed puppy without understanding how incredibly fragile a toy breed is. You can seriously injure or kill a Yorkshire Terrier by stepping on him or by sitting on him when he's curled under a blanket or pillow, where he frequently likes to sleep. And Yorkies can seriously injure or kill themselves by leaping from your arms or off the back of your sofa. A larger dog can grab a Yorkshire Terrier and break his neck with one quick shake. Owning a toy breed will mean constant supervision of what's going on around your tiny dog. Yorkshire Terriers must always be kept on-leash -- they are just too easy to injure when not under your complete control. 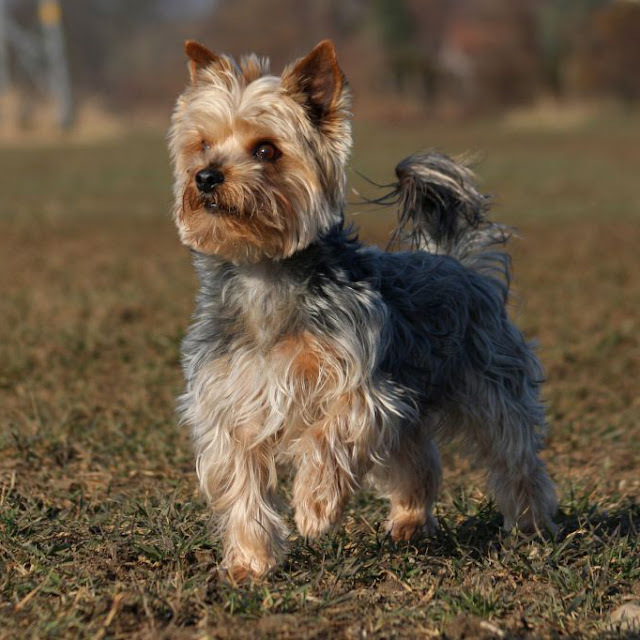 Yorkshire Terriers are considered a great option for people with dog allergies or asthma.They are recommended for older children and need training because they can be difficult to house train. The Yorkshire Terrier is not suited to being an outdoor dog only. The ideal owner are those who require a family companion and are prepared to have a dog living indoors or in the enclosed backyard most of the times. The dental issues experienced by this breed make tooth brushing and regular dental exams a must. Grooming will require maintenance in the form of daily brushing and regular grooming. These small dogs are affectionate with their families and make excellent watchdogs. If you can handle the maintenance, a Yorkie might be a great fit for your family.